So here's a quilt that I've been making but not blogging, apart from a couple of peeps at the quilting. It was a present for a friend, who really wanted something scrappy and loved the version of this that I have on the spare bed. This one is 70" square. Strips were mostly cut 1.5" but sometimes I left them at 2" rather than waste fabric. All scrap, including the binding. It was pieced around other projects: I tried hard to be organised and used it as a leaders and enders project, which I've never done before. As long as I remembered I was doing it, I found it quite an efficient way to keep these blocks ticking over. I started quilting it at the end of July, finished it on 14th October, handed it over on 26th. 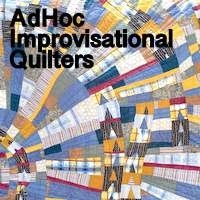 Finally, a reminder that it's not too late to link up any improv/modern utility quilting you've been doing with AHIQ, here or on Ann's blog. and Can I Get a Whoop, Whoop at Confessions of a Fabric Addict. Knowing where it is going I'm sure she'll be thrilled. What a great use of those scraps. I like that you left some 2" strips in there. I'm sure it will be loved for years to come. The quilt is gorgeous! Your friend will treasure it! It is beautiful! I love this concept and how you used all scraps! Well done...and inspiring! Terrific quilt! My Dumpster Diving was part of the "lego" craze started by Tonya Ricucci (author of Word Play Quilts and former blogger at Lazy Gal Quilts). I actually have another one cut and ready to start sewing next year. They are so much fun and use up so many scraps! Wow, what a beautiful and generous gift for a friend. I bet it will be treasured. Congratulations on your finish. Bright and beautiful and I love that hand quilting. Gorgeous! I've never tried the leader/ender way. Might have to do that someday. Once I have a decent set of scraps I will have to try it! You must have amazing patience! And this is how I get in trouble, Kaja. Like you, I've seen similar designs around the web; I even have one pinned to a board. Now you're reminding me of it while so many others are in the queue. What a fabulous finish. Always impressive that you hand quilt them in such rapid time. Your friend will love it. A lovely quilt, so colourful and scrappy! And I love all your hand quilting, it really adds to that handmade feel. A super finish Kaja - wonderful use of your scraps. This is the coziest quilt ever! Great String Quilt! And the hand quilting is a wonderful touch! I love it!! It's a beautifully scrappy quilt!! Oh I love it. This is the prettiest scrappy quilt I think I've ever seen. I love it! Thanks for sharing This! What is it about these scrappy bits coming together that speak to us so very well? Love this! I love, love, LOVE this quilt! Lots of color and scrappy fun. Thank you so much for sharing. How wonderful this one is! I love the scrappiness and the colors. How fun and happy! I've never done a leaders/enders project, but this has me rethinking whether I should. Wow, Kaja, that is beautiful! It just makes my heart sing! Now that's what I call a scrappy quilt, gorgeous. I keep meaning to start a 'leades and enders' project, I would love to make such a happy quilt. This is really lovely -- I see some beautiful fabrics in there! Effective design and a great finish. Another idea to store away! Every time I see one of those quilts it makes me want to get my scraps out and sew them in strips. Nice! Your other red, white and blue is coming along lovely, too! Congrats on the finish! Your friend is very lucky! This is a fantastic finish. Congrats! WOW!! that is so amazing!!! Love this one. It is so yummy!!! Such a fun quilt! I remember contributing a long, long strip of scraps to someone awhile back for a quilt sort of like this. At the time I was all inspired to use up fabrics languishing in my stash for a similar quilt. Haven't done it yet, but if I run out of "won" fabric for my donation quilts, I'm definitely going to have to do this!! Thanks for the nudge. And doing it as a leader/ender is intriguing.